For the first time, a team of astronomers at the Very Large Telescope (VLT) in Chile have confirmed, directly, the existence of a young gas giant planet, similar to Jupiter, still in the early stages of formation, embedded in the accretion disc of its host star. The international team of astronomers led by Dr. Sascha Quanz used data provided by the NACO optics instrument to confirm their earlier hypothesis: a young planet believed to be between 1 and 10 million years old — similar to our solar system’ gaseous planet Jupiter — is orbiting the star dubbed HD 100546. 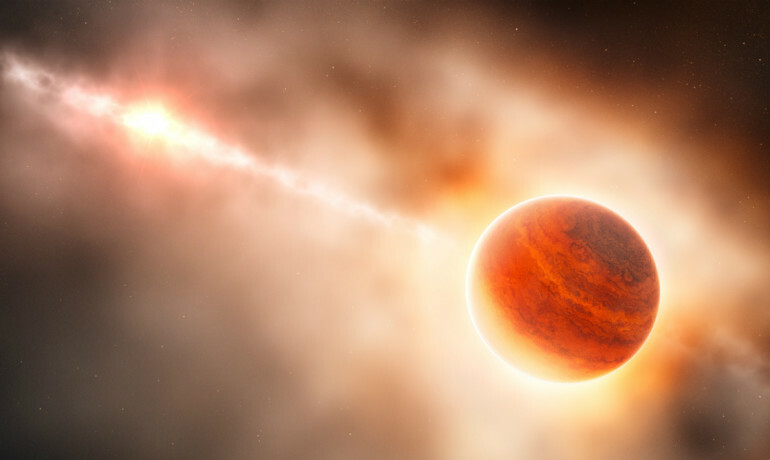 The planet is still in the process of formation and possibly gathering material from the massive disk of gas and dust surrounding its host star. It’s a scenario we still can’t rule out completely. But it’s much less likely than our explanation, which suggests that what we’re seeing is the birth of a planet. It provides us with unique observational data on what happens when a gas giant is formed. The exoplanet is just 335 light years away from us orbiting the star HD 100546 which is one of our cosmic neighbors. Its located near the outer regions of its sun’s circumstellar disk, which lies at a distance of 300 astronomical units (AU) from its host star — comparable, that would be far beyond the Kuiper Belt. Protoplanets’ scientists suggest there’s a second planetary candidate at around 13 AU orbiting the stars and its also believed to be a gaseous planet, but its yet to be confirmed. Anyway, its a good chance for astronomers to observe and study the formation of several planets in a single star system. Featured image: © 2013-2015 DanielComDesign.